As a tech company we know the importance of onboarding. We're on a mission to ensure your customers / clients get off to a great start with a flawless onboarding and implementation experience. We have over 1,300 customers, many of whom rave about our software. We'll let them do the talking... Check out some of our tech/SaaS case studies below. Want to take TaskRay for a free test drive? We have a number of options for a free trial, including one where TaskRay comes bundled with a trial version of Salesforce (so you don't have to worry about your existing data). 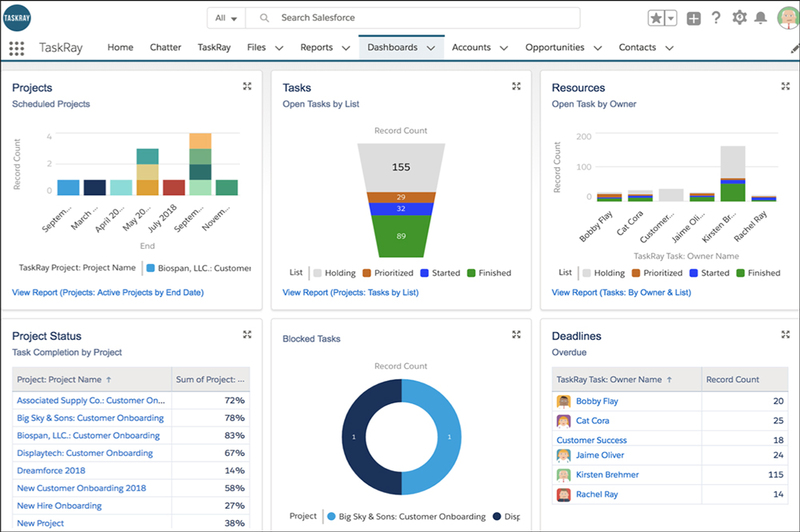 The options are set up so that you have nothing to lose and everything to gain once you see how powerful and easy the TaskRay app works within Salesforce. Want to do a little more research on your own? You can check out a recording of a recent intro webinar here, where you'll see a quick demo of product functionality, use cases, and much more. Or you can see the full list of all our previous webinars here. And you're always welcome to poke around our web site for more information on pricing, features, and a lot more. If you’re looking for information on customer / client onboarding best practices with Salesforce, check out our recent video where we outline the 4 critical steps—all in 60 seconds. And finally, do you want to do more than just onboarding or need a full project management solution? No worries, we've got you covered. You can see our full project management capabilities here.